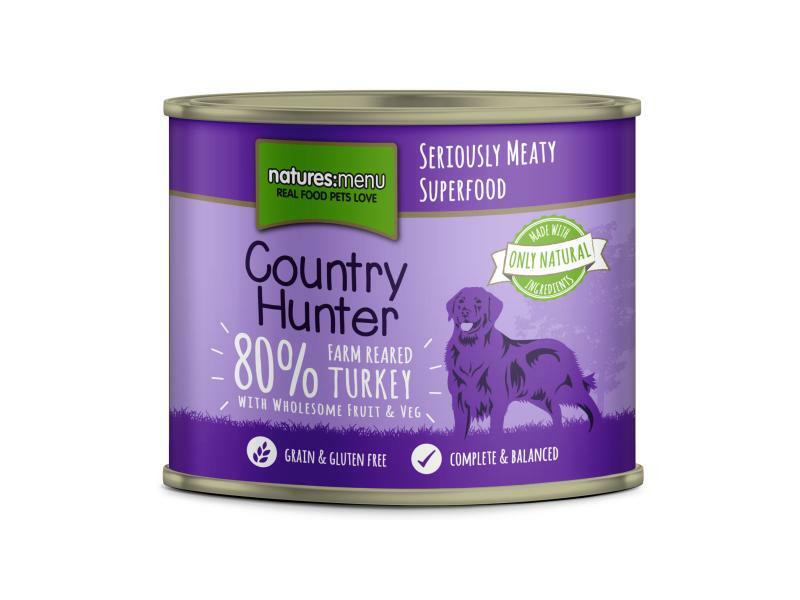 Natures Menu Country Hunter Seriously Meaty Dog Canned Food is a delicious, grain and gluten free food guaranteed to have your dog's mouth watering! Available in an excellent selection of Salmon, Venison, Duck and Rabbit flavours there is something for everyone. 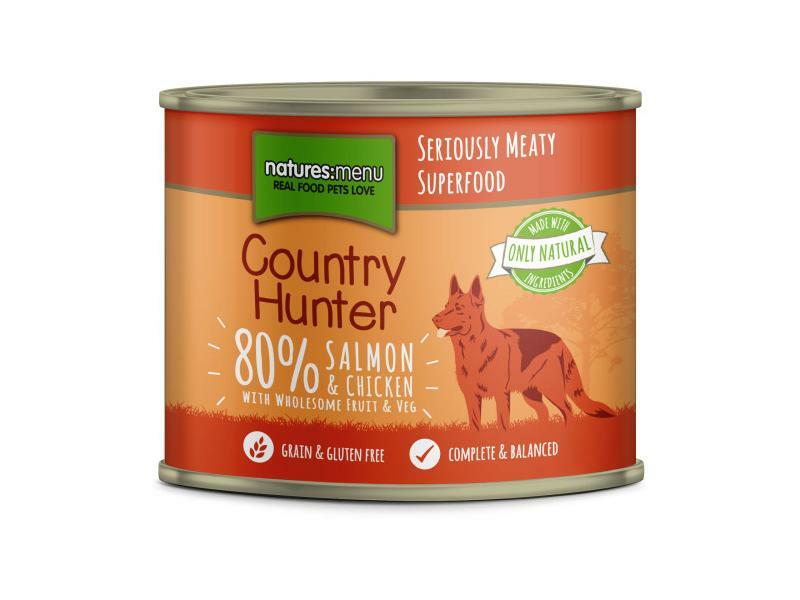 A premium, naturally meaty meal made with responsibly sourced Salmon fillets and tender cuts of Chicken, complemented with a generous portion of wholesome superfoods, fruit and vegetables. Grain and gluten free. Contains no nasty meat meals or derivatives, artificial colours or flavourings. A great alternative to raw feeding when travelling or staying away. Made with 80% wild venison and a nutritious blend of blueberries, apples, pears and root vegetables. A single protein complete and nutritionally balanced meal packed with ethically sourced, human grade meats, scrumptious fruit and veg plus essential vitamins and minerals. Grain and gluten free. Contains no nasty meat meals or derivatives, artificial colours or flavourings. Protein 10.1%; Crude Oils & Fats 6.9%; Crude Ash 2.3%; Crude Fibres 0.4%; Moisture 77%. A deliciously meaty single protein meal made with 80% rabbit, plus tangy cranberries, wholesome root vegetables and apples. A complete and nutritionally balanced meal packed with ethically sourced, human grade meats, scrumptious fruit and veg plus essential vitamins and minerals. Grain and gluten free. Contains no nasty meat meals or derivatives, artificial colours or flavourings. A truly tasty single protein meal with succulent Duck and a generous portion of wholesome superfoods, fruit and vegetables. A complete and nutritionally balanced meal packed with ethically sourced, human grade meats, scrumptious fruit and veg plus essential vitamins and minerals. Grain and gluten free. Contains no nasty meat meals or derivatives, artificial colours or flavourings. A great alternative to raw feeding when travelling or staying away. Made with 80% Farm Reared Turkey plus wholesome fruit and vegetables. A single protein complete and nutritionally balanced meal packed with ethically sourced, human grade meats, scrumptious fruit and veg plus essential vitamins and minerals. Grain and gluten free. Contains no nasty meat meals or derivatives, artificial colours or flavourings. 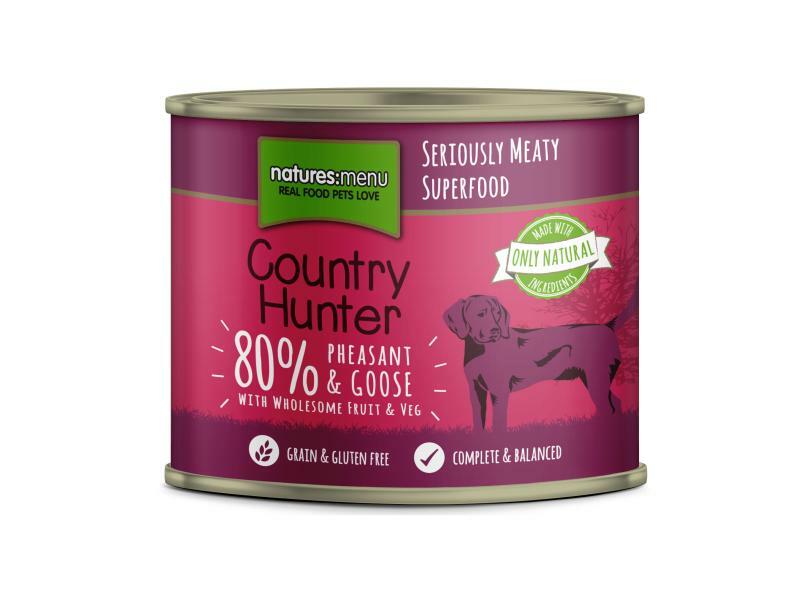 A complete and balanced meal with deliciously meaty cuts of Pheasant and Goose and a wholesome blend of red berries, nutritious pumpkin seeds and autumnal vegetables. A complete and nutritionally balanced meal packed with ethically sourced, human grade meats, scrumptious fruit and veg plus essential vitamins and minerals. Grain and gluten free. Contains no nasty meat meals or derivatives, artificial colours or flavourings. A deliciously flavoursome meal made with Mackerel and tender cuts of Chicken, with a generous portion of red berries, nutritious pumpkin seeds and autumnal vegetables. 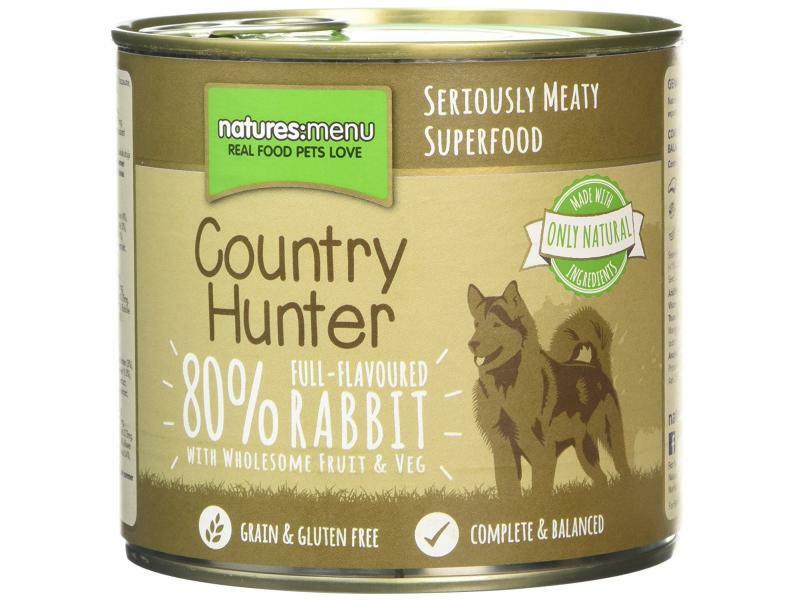 A complete and nutritionally balanced meal packed with ethically sourced, human grade meats, scrumptious fruit and veg plus essential vitamins and minerals. Grain and gluten free. Contains no nasty meat meals or derivatives, artificial colours or flavourings. A deliciously meaty meal of wild boar, with a tasty blend of hedgerow berries, apples and wholesome vegetables. A single protein complete and nutritionally balanced meal packed with ethically sourced, human grade meats, scrumptious fruit and veg plus essential vitamins and minerals. Grain and gluten free. Contains no nasty meat meals or derivatives, artificial colours or flavourings. 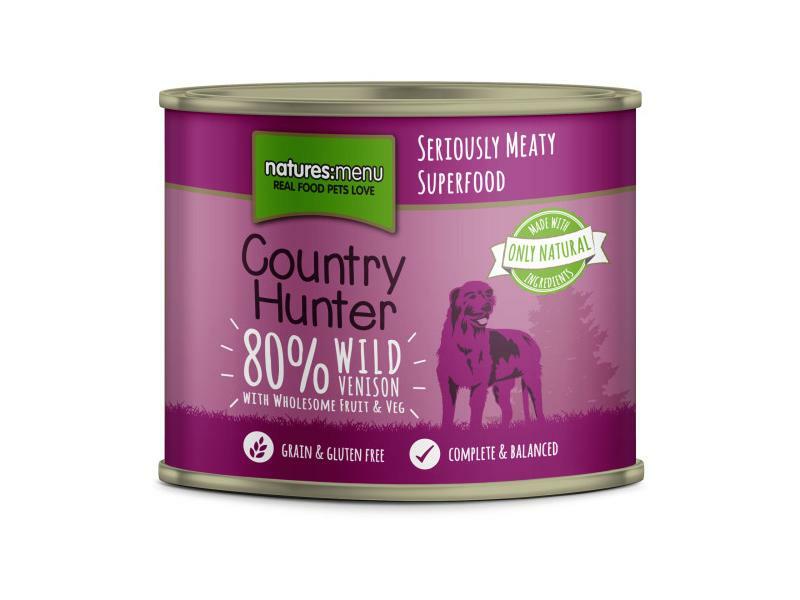 Below are some recent questions we've received regarding Natures Menu Country Hunter Seriously Meaty Can Food, including answers from our team. It is suitable to feed the canned range to a 6 month old puppy. These diets can be fed to puppies at 16-20 weeks of age and above.